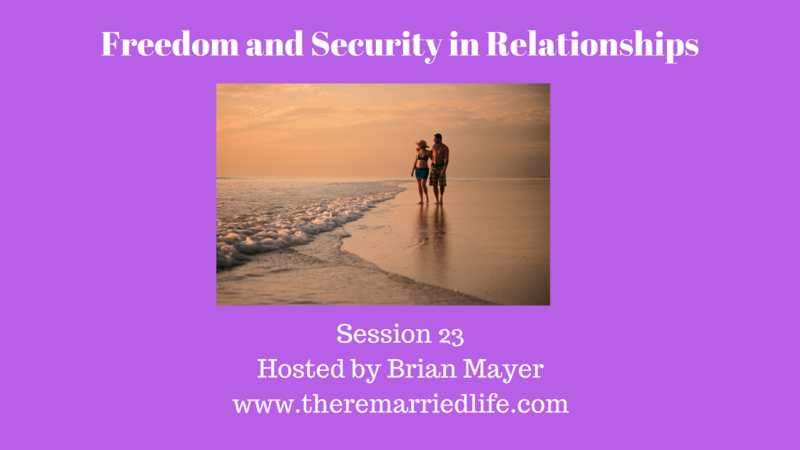 Today’s episode is called Security, Freedom, or Both in Relationships. In relationships, there can often appear to be a power struggle for security and freedom. When one person feels they are being stifled, she might say there is too much security and not enough freedom. For the partner that says they do not have an individual identity, he might say I do not have enough freedom. Often the pendulum will swing wildly in a relationship. The same can be said about freedom and security when it comes to a nation’s interests especially in the political arena. In my lifetime I never more have seen this debate after the terrorist attacks in the United States on September 11, 2001. While the ultimate goal for both sides was the safety of our citizens, there were vastly different approaches on how to get there. One side will often say that giving all citizens many more freedoms such as the ability to carry guns or other deadly weapons, can help police and the government while another side might say being more restrictive on everyone is this issue is the answer. Both believe that the ultimate result in their position is that security and freedom will be balanced. According the Legatum Prosperity Index of 2017, the top 2 countries with the most personal freedoms are New Zealand and Canada while the bottom 2 are Yemen and Sudan. The U.S. is ranked as 28th in personal freedom. The most secure counties were touted as Singapore and Iceland while the bottom 2 are Congo and Iraq. The U.S. is ranked 60th in security. Legatum is an international think tank based in London that focuses on what it can do to ensure societies are free, just, and flourishing. Are security and freedom the be all end all, of course not. But they should be monitored in a relationship. Take for example, a crying baby in the crib. The baby continues to cry because he does not feel secure not knowing where his mother or father is. The baby is also certainly not free since it is in a crib with the inability to explore. This all changes when mom or dad enters the room. The baby stops crying and if put on the floor may actually begin to explore with toys or books etc. In this case, the baby felt the security of the parent’s presence and when that need was taken care and that mom put baby on the floor he or she felt comfortable to use that freedom to explore. The same can be said in adult romantic relationships. These relationships should be the both of you against the world. The world is a very difficult place and the home must be a safe haven from that. If the home is a safe haven, where conversations are nurtured and love is freely given and freely accepted, then it can give each of you the confidence to pursue your dreams and passions to further advance you as an individual which will have a positive ripple effect on the relationship. Past relationships and marriage will cause projection in some cases. What is projection? This happens when one of you who maybe did not have a voice in a prior marriage, were emotionally, physically, or sexually abused and you begin to associate your new partner with a prior partner. If this past was the case, then simple conversations may turn into blowups, or coming home late may be met with skepticism. Identifying that this is an issue for you is the first step to healing this issue. Not healing this will indeed cause an imbalance of freedom versus security. I’ve mentioned this book many times on this show, but I would highly recommend Boundaries in Marriage by Cloud and Townsend. This will help each of you set healthy boundaries so that you can keep the good in and the bad out. Often people will ask, well can’t boundaries be used to control. They of course can, but if they are used to control then they are not being used properly. Boundaries still allow the person on the outside freedom of choice, but recognizing that the person inside the boundary will only allow them in if certain things are met.